You were probably introduced to poison ivy as a kid by a concerned parent. You may have learned to look out for the three shiny leaves growing close to the ground that distinguishes poison ivy from other low-growing plants in forests and fields. You also likely learned about the consequences of wading through a patch of poison ivy: an unbelievably itchy allergic reaction in the form of a skin rash that persists for days. How does poison ivy manage to trigger this response in unsuspecting humans? It’s a defense mechanism that the plant developed to protect itself. Poison ivy produces an allergic oil that, when brushed against or touched, causes a bad case of contact dermatitis. The red, itchy blisters that accompany exposure to poison ivy can take anywhere from two to 10 days to show up. Two other common poisonous plants—poison oak and poison sumac—can cause a similar allergic reaction. For a sensitive few, even seemingly “friendly” plants like tomato leaves, marigolds, and poinsettias can trigger allergic dermatitis. It’s not contagious so you don’t have to keep you or whoever is nearby in a self-imposed quarantine. Once you’ve had poison ivy, you’re more likely to get it again, as you have now developed a full-blown allergy to it. It’s estimated that 65% of all Americans are allergic to poison ivy. You can’t really get a rash from breathing the air around a poison ivy plant. That means it’s safe to walk by any plants because you can’t inhale the toxin that’s released in the oil. To prevent a run-in with poison ivy, wear long sleeves and pants to keep skin protected from accidentally touching any leaves. If the weather is too hot for this type of clothing, make sure you stick to pathways and avoid wading through areas of brush and forest seedlings. 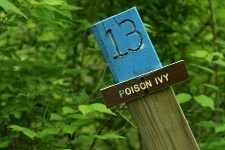 Heed warnings on trails that tell of potential poison ivy colonies. You can also make sure you wear gloves when gardening if you live in an area known to have poison ivy growing. After being outside, use soap and water to wash any part of your skin that may have been exposed to poison ivy. Washing immediately after coming in contact with a plant can remove most of the poisonous plant oil. After 15 minutes, only half the oil will wash off. Waiting an hour will mean that none of the poisonous oil can be washed off –your skin will have absorbed it. If you have trouble breathing, experience a rash that covers most of your body, or you notice lots of swelling (particularly if an eyelid is swollen shut), go to the hospital as soon as possible and get medical care. “Busting myths about poison ivy, from the Harvard Health Letter,” Harvard Health Publications web site, May 2013; www.health.harvard.edu, last accessed June 24, 2013. “Poison Ivy: Tips for Treating and Preventing,” The American Academy of Dermatology website; www.aad.org, last accessed June 23, 2013.